Toyota, the second biggest automaker in the world, announced an ambitious plan today to tackle mobility and delivery services in the age of autonomous cars. Apparently it involves weird, see-through self-driving boxes roaming through cities, delivering people, packages, and pizza. Toyota is calling them “e-Palettes” and describes them as “fully-automated, next generation battery electric vehicle[s] designed to be scalable and customizable for a range of Mobility as a Service businesses.” Think of them as transparent cargo or shipping containers on wheels that grow and shrink in size depending on their specific task. 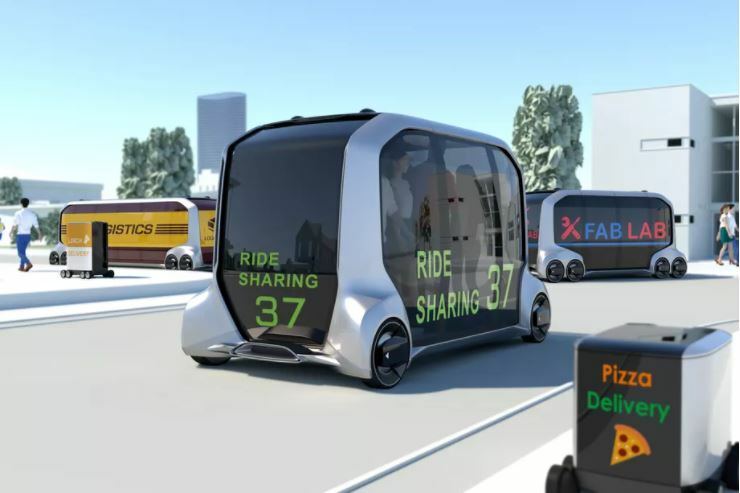 Toyota envisions these serving a variety of functions, from typical mobility services like ride-sharing and carpooling, to less-typical purposes like serving as mobile office and retail space, medical clinics, hotel rooms, and more. Need a new pair of shoes? Summon the mobile shoe palette and try on different sizes as you travel from here to there. Hungry from some pizza? Hail the roaming pizza oven, complete with (prisoner?) chef. As far as concepts go, this one is pretty out there. “Just think how good e-Palette would be at Burning man,” quipped Akio Toyoda, Toyota Motor Company’s bespectacled president, from the stage at CES in Las Vegas today. That about sums it up.